It’s the beginning of the season of wedding receptions, summer dinner events, get-togethers, and banquets. I thought this might be a good time to post an article on dining and guest etiquette. 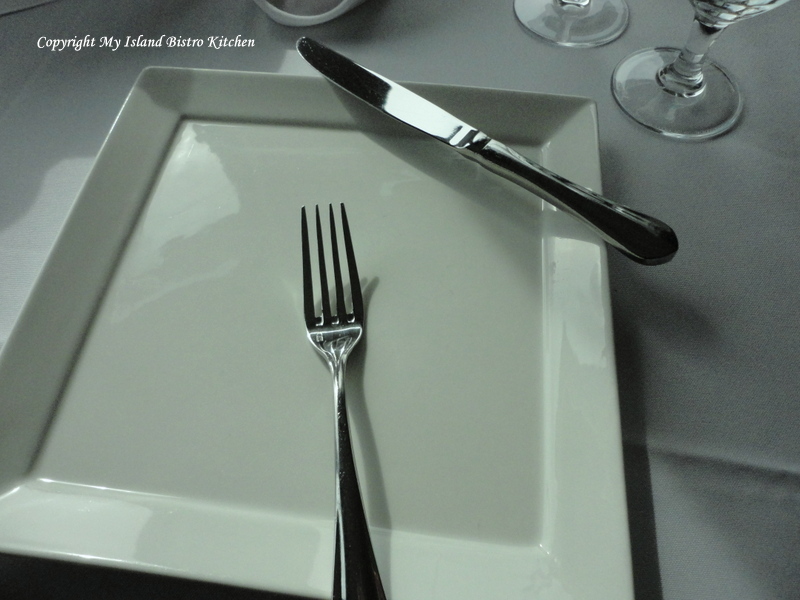 Many of us, at one time or another, have probably found ourselves at a dinner event, sat down to a somewhat crowded table with heavily laden place settings that displayed more cutlery and glassware than imaginable and wondered, hmmm, which bread plate was ours – the one on the left or on the right of the place setting. Or, perhaps you have wondered what to do if your neighbour to the left has started to use your bread and butter plate thinking it was his or hers. Maybe you have deliberated over which utensil to use. 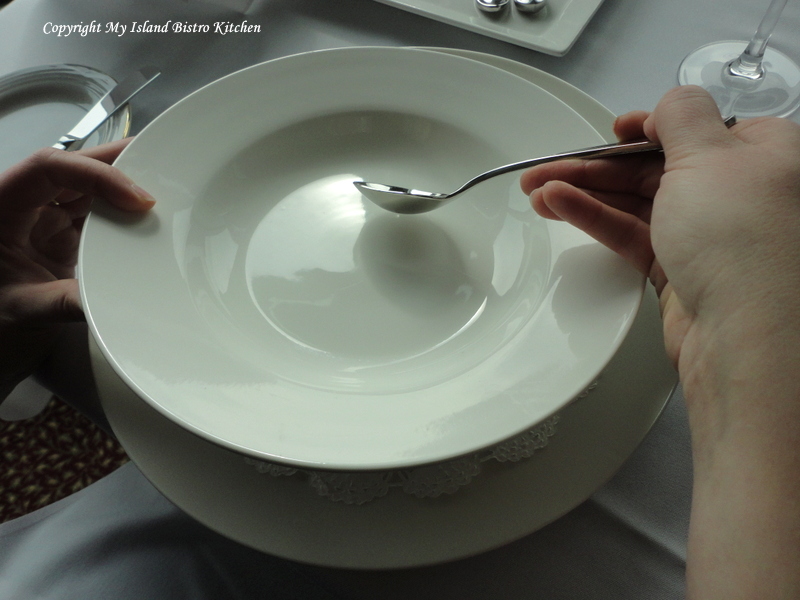 Perhaps you have wondered if it is proper to tilt or pick up a soup bowl to get the last drop of that yummy soup. For answers to these and other guest and dining etiquette questions, I contacted Tina Lesyk, Banquet and Catering Coordinator at The Culinary Institute of Canada in Charlottetown, PEI. I first introduced you to Tina in May 2012 when I posted a feature on how to properly set a table. The purpose of learning and practicing proper table manners is to feel comfortable at any table, not insult your host or hostess and, in the case of business functions, it is essential for professional success. Let’s face it, no one wants to embarrass him or herself in these social situations. Follow the basic guidelines outlined below and you’ll be well on your way to being a model dinner guest in any setting, whether that be at a dinner in a private home, in a restaurant, or at a formal or state dinner. For a description and explanation of the elements of place settings, please see my earlier posting “Let’s Set the Table”. First, let’s begin with some general tips on dining and guest etiquette. – The old rule still holds true – elbows off the table when food is present. – You should sit in the chair so that your back does not actually touch the back of the chair – this forces you to sit up straight. – Everyone, leave the tech gadgets away from the table. Out of respect for the host/hostess and other guests, put cell phones on vibrate. If you absolutely must take a call during dinner, never answer the phone at the table in the presence of the host/hostess and other guests. Excuse yourself and move to another room to discretely take the call. The same applies to making a telephone call. – Never use a toothpick while at the table. Picking food out of your teeth in front of fellow guests and the host or hostess is not appropriate conduct. – If you drop a piece of cutlery on the floor, leave it there; do not retrieve it. If you are in a restaurant, signal to the waiter to bring you a replacement. If at a private event at someone’s house, ask your host/hostess for a replacement. – If you find you have taken a bite of food that has a piece of gristle or small bone in it, do not make a big scene or draw attention about it. As discretely as possible, remove the item with your fork (the utensil it went into the mouth with) and set it to the side of your plate. – If you have a severe food allergy, advise your host/hostess in advance of the function. – If you are served a food that you do not like and cannot eat, make no mention of it; rather, simply go through the motions of moving the food around the plate. – Never push the plate away from you when you have finished eating and do not stack up plates, utensils, and so forth, from your place setting – you may think you are helping but this gets in the way of the servers’ techniques for clearing tables. – Applying lipstick, combing hair, and so forth are considered grooming activities, inappropriate for the dining table. The purpose of the napkin is to protect clothing by acting as a shield or guard for spills and, if necessary, to dab the fingers and mouth, and remove traces of food particles from the outside of the mouth. 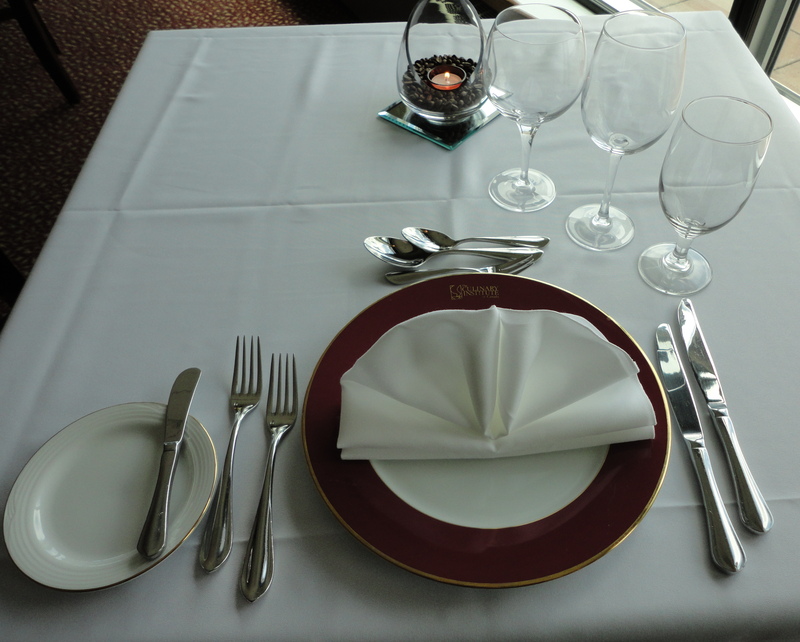 – Remove the napkin from the place setting and place it on your lap immediately upon being seated at the table. – For a normal-sized napkin, completely unfold the napkin and place it on your lap. It is not considered appropriate (and there is no need) to “shake” a napkin out of its fold. Simply, and very discretely, unfold the napkin. – If the napkin is exceptionally large, fold it in half and, with the fold of the napkin facing you, place it on your lap. – The napkin always goes on the lap and is never tucked into the collar and used as a bib. – The napkin remains on your lap during the entire meal. If you need to temporarily leave the table during the meal, loosely bunch up the napkin and place it to the left of your plate. When you return to the table, re-place the napkin on your lap. At one time, the general rule was to place the napkin on the seat of your chair during a temporary absence from the table. However, there are a couple of issues with this that suggest an alternative location for the napkin may be preferable. First, the napkin may have food particles on it that will stain an upholstered chair and may also stain your clothing or leave crumbs on the chair when you return to the seat. Second, given the sole use of a napkin is to dab the mouth, many do not want to use that napkin for that purpose after it has laid on the seat of a chair that is used for, uh, sitting on the derrière. One never knows how clean those chairs are! Now, when bunching up the napkin that has stains or food particles on it, you will want to loosely fold the napkin in such a way that the stains/food particles are not visible when you temporarily leave the napkin on the table during your absence; leave the napkin, clean side up. You will also want to make sure your napkin does not touch the elements of the place settings of your neighbors to the left and to the right. – A napkin is not a tissue or handkerchief so avoid using it to blow your nose (Note – you should excuse yourself from the table before blowing your nose). – At the end of the meal, loosely bunch up the napkin and place it to the left side of your place setting, not on the dirty plate. A paper napkin, however, could be left on the [dirty] plate since the napkin will be discarded anyway. – If the cutlery is already on the table, begin using the utensils placed farthest away from the plate (assuming there is more than one fork and knife at the place setting). If there is no cutlery at the place setting when you sit down at the table, this means the host/hostess will bring the necessary utensils with each course of the meal. – Never gesture or point with a piece of cutlery. There are two main styles – American and European. Normally, with this style, you hold the fork in the hand you write with. For demonstration purposes, I will describe the procedure for someone who is right-handed. Hold the fork in your left hand and the knife in the right. With fork tines facing down, gently spear the food with the fork to hold it in place as you cut the food. Once a bite-sized piece has been cut, rest the knife diagonally across the upper right edge of the plate. Switch the fork to your right hand and, with tines facing up, pick up the food and transfer it to the mouth. 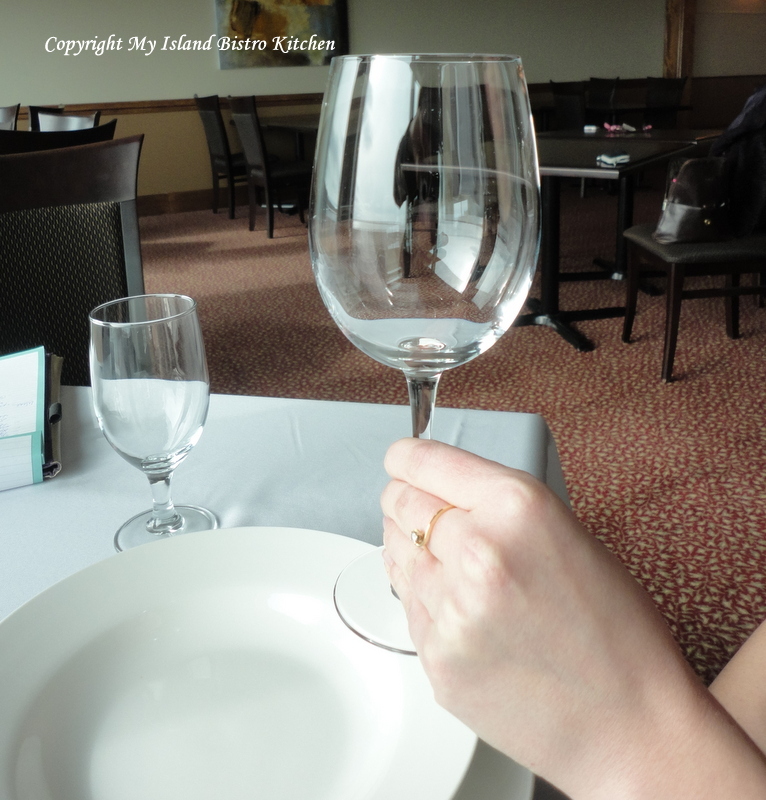 If there is a pause in eating a course during the meal (e.g., to take a sip of water or briefly leave the table), there is a way to signal to the wait staff that you have not yet finished eating. 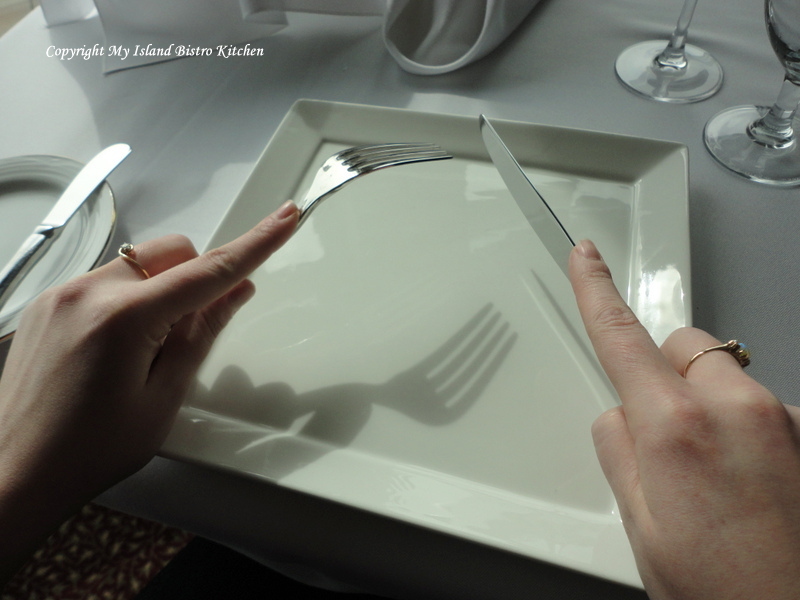 Lay the fork, tines facing up, as shown in the photo below and place the knife, diagonally on the upper right-hand corner of the plate. Note that, once the knife has been picked up from the table, it should not touch the table again during the meal. At the conclusion of the course, place the knife and fork together (fork tines up), parallel to each other at about the 4:30 clock position on the plate to signal to the wait staff that you have finished eating. With this style, the fork remains in the left hand and the knife in the right for the entire meal. Food that needs to be cut is speared gently with the fork and cut with the knife held in the right hand. The knife is used to push food onto the back of the fork. The food is then transferred to the mouth with the fork, tines facing down, held in the left hand. 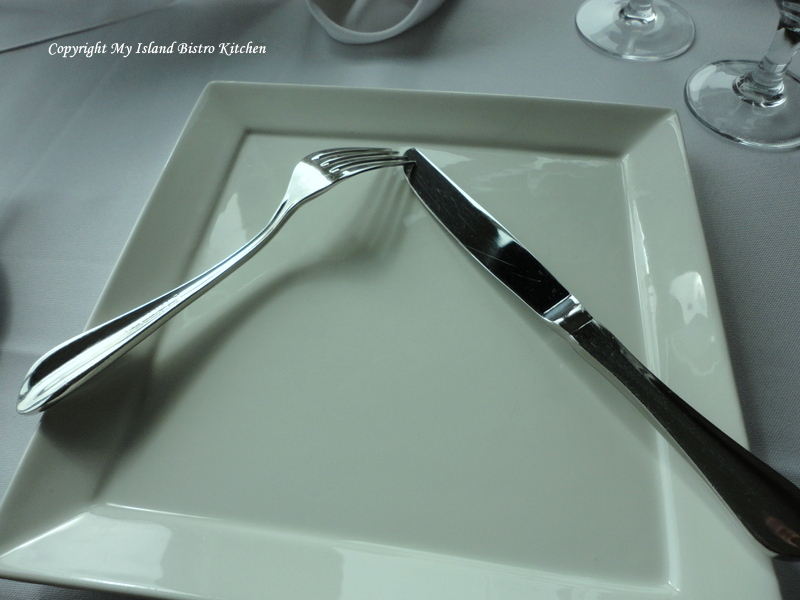 If there is a significant pause during the course, the fork and knife are placed on the plate as shown in the photo below. 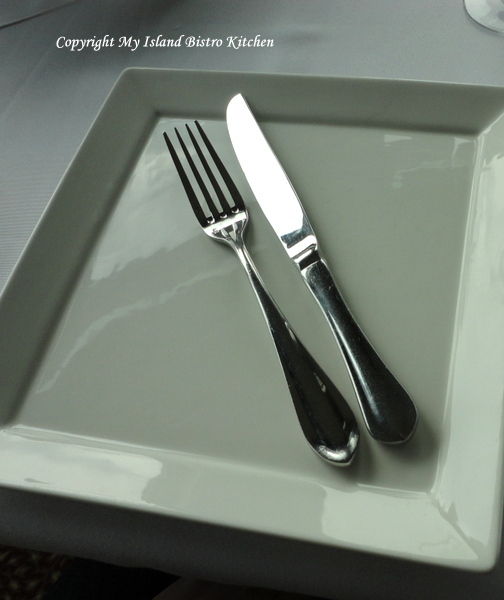 At the conclusion of the course, place the knife and fork together (fork tines facing down) at about the 4:30 clock position on the plate to signal to the wait staff that you have finished eating. This would be the same as the American style with the only difference being that the fork tines would face downward toward the plate. – Follow this easy trick for remembering which bread and butter plate and which glass is yours: With your left hand, touch the tip of your first finger to your thumb. You will see it makes a lowercase “b” shape; “b” stands for “bread” – it goes on the left of the place setting, aligning with your left hand. Now, do the same thing with the first finger and thumb of your right hand. This makes a lowercase “d” shape. The “d” stands for “drink” and drinks go the right of the place setting, aligning with your right hand. – If you find your neighbour has already starting using your bread and butter plate, discretely ask your host/hostess (if at a private dinner party) or your server at an event to bring you another. – Break bread and rolls with your fingers (as opposed to cutting with a knife). The knife is provided for buttering the bread or roll, not cutting it. 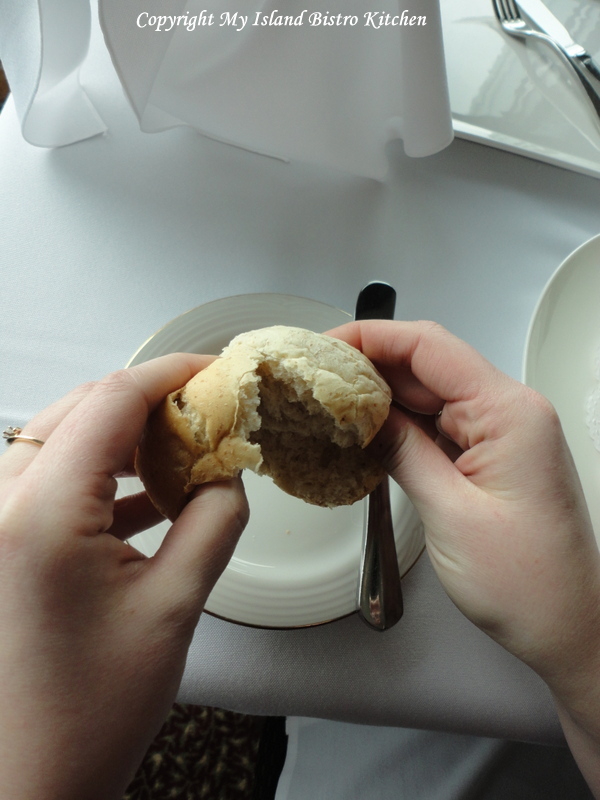 – If the bread or roll is served cold, take the butter pod and place it on to the bread and butter plate provided and butter each piece/bite of the broken bread or roll at a time as you eat each bite. – If the bread or roll arrives warm at the table, break it apart and butter each broken section all at once to let the butter melt. – The appropriate way to consume soup is to scoop it away from you as you will be less likely to spill or splash it on yourself. – Do not place the entire bowl of the soup spoon in the mouth. Rather, sip the soup from the spoon. – It goes without saying that there should be no ‘slurping’ noise during the soup-eating process! – If the soup is too hot to comfortably consume, wait for it to cool. It is never considered proper etiquette to blow on the soup or stir it vigorously to cool it. – It is inappropriate to dip bread in the soup as a way to gather up the soup – this is what a soup spoon is for. – It is acceptable to tip the bowl ever so slightly away from you to scoop up the last bit of soup. – It is not appropriate to lift the bowl up and hold it close to the mouth as you consume the soup. – If the soup bowl has been served on a server plate, place the spoon on the server plate once you have finished the soup. If there is no server plate provided, leave the spoon in the bowl. – If you are not a wine drinker, or do not want any wine with the meal, there are two ways to handle the situation when wine is being served: 1) discretely place your hand on top of the wine glass as the server approaches you with the wine. This will signal to the server that you do not wish to partake; or 2) simply let the server pour the wine and just do not drink it. The key is always discretion – you don’t want to make an issue of anything or draw attention to yourself. – The proper way to hold a wine glass is by the stem so that your hand does not warm the wine or that fingerprints get left on the goblet itself, making it look smudgy. Holding the glass by the stem is also considered to give you better control when moving the wine in the glass and tasting it. – Monitor your consumption – if several wines are being served throughout the meal, it is completely acceptable etiquette not to finish every glass. Intoxication does not make a good dinner guest. – Wait for everyone at the table to be served before starting to eat. This applies to each course of the meal. If you are at a private dinner, it is proper etiquette to wait until the host/hostess picks up his or her fork before starting to eat unless, of course, the host/hostess tells you to start while he or she is still continuing with the dinner preparations and serving other guests. – If food bowls, platters, etc., are being passed around the table for guests to serve themselves and one is starting with you (i.e., you pick up the bowl or platter directly in front of your place setting), offer it first to the person on your left while holding it for him/her to serve him/herself. Then serve yourself and pass the item to the person on your right. Always send everything to the right around the table and never directly pass items to guests across the table. – Never intercept food being passed. For example, if someone asks for the basket of rolls to be passed, do not sneak a roll from the basket as it is going by you. Rather, after the requester has been served, ask for the item to be passed back to you. – Salt and pepper shakers should always travel in a set together even if someone ask for just the salt or pepper to be passed to him or her. This is because the next person looking for them will find them together, not orphaned here and there somewhere on the table and end up having two people passing them from different directions along to the requester. When someone ask you to pass him or her the salt and pepper, set them down on the table in front of the requester. This is the preferred method as there is less chance of dropping the items or upsetting them as could happen if they were transferred hand to hand. – It is considered proper etiquette to always taste the food before seasoning it or you may insult the chef/host/hostess who has prepared the food – theory being that the chef has already properly seasoned the dish before serving it. – Stay with topics that are neutral and of general interest, non-conflictual in nature – the old advice about avoiding discussions on politics and religion still holds true. The last thing you want to do is to instigate, or become engaged in, a heated discussion that leaves everyone around the table uncomfortable or at odds with each other. – Do not discuss food allergies, health issues, or bad experiences with food. The fact that you may be lactose intolerant, have irritable bowel syndrome, or once got violently sick from eating shellfish, or have had food poisoning, does not make these subjects suitable table topics. As they say, that’s way too much information and detail, particularly at a dinner table where food is being served. Nothing can zap an appetite faster than to have a dinner guest regaling at length the graphic details of a bad food experience. My thanks again to Tina Lesyk for taking the time to chat with me about proper guest etiquette and to share her extensive knowledge on the topic. We certainly haven’t covered every aspect of dining etiquette but, hopefully, we have covered the main points. Happy dining!